Sciblogs | What kind of scientist are you? Theory predicts – Exploring what theory says ought to happen. Gregory Benford is really writing about physicists (he’s a physicist himself) but the categories are basic enough they ought to apply to other fields. 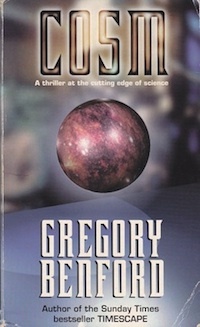 If you’re a fan of hard science fiction and haven‘t read Gregory Benford’s work, do. His work is grounded on ideas taken from physics/astronomy/cosmology played out with strong lead characters. There’s a chat on the lablit forums opened by the author, with more thoughts elsewhere on the same forum. Reviews of COSM can be read at Suite101, goodreads and elsewhere. ** It’s a bit harder to pick Gregory’s intentions on this one; this is my interpretation. I would add a fifth: It’s useful. And so I’d clearly be a mix of 1 and 5. One thing I thought add was to mention that Gregoryâ€™s list is really of those involved in research, as opposed to the 70%-odd that move out of academic. People industry for example might not easily relate to Gregoryâ€™s categories (?) Thereâ€™s more, but I was hoping others might bring that to the comments. Interesting like any group of people there are various tribes, I am definitely trying to pry into mother natures secrets and also an experimenter. Mother natures secrets prepare to have your mind blown.. This is so interesting, no straight lines, no squares, the helix and Pi.. Thanks you adding to this – now youâ€™ve been approved you can comment with being held up. Iâ€™ve got a fair bit of â€œI want to knowâ€ in me, too. More on that later maybe. While Iâ€™m writing, I put this up in part to see how people saw themselves in relation to what they do, an extension on the science careers articles Iâ€™ve written in the past. Definitely a 1 here, but I would add to that a version of Waiology’s “it’s useful” – application of science to make the world a better place. A while back I commented on a survey which looked at what motivates scientists and technologists in New Zealand which reflects some of the points mentioned above.